Another day, another redhead to profile. This time, I take a look (get in line!) 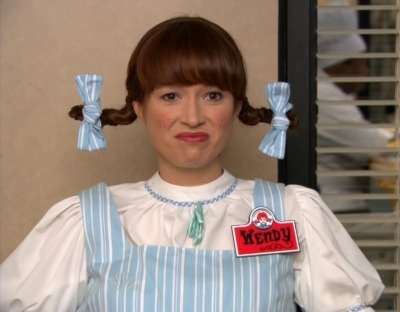 at the queen of the Office, Ellie Kemper. She also has roles in Bridesmaids (high-grossing buddy comedy) and Mystery Team (highly gross). Hopefully, Greg Daniels’ writing team have finally made Kelly Erin Hannon’s ditziness endearing. Alas, her charisma couldn’t get the Stache Act to pass or the stacheact.com website to work properly. Oh, well. Recently, Nescafe wants you to “Like” Ellie and get your browser and Facebook data trashed…, er get “life-coached” with a Facebook app. Sorry, Ellie, I like you enough not to have your buddies touch my data. With the fading viewership of the Office, at least she “NBC-famous” (in semi-obscurity) now. Ellie in a full starring role in a major movie. This spoof trailer for “Checkmates” is a tease. This is already superior the The FP, yo. 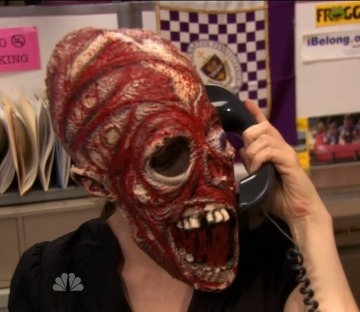 Finally, here are two occasions of a Hannon Halloween: as a scary-headed receptionist in the seventh season episode, “Spooked,” and as fast-food icon Wendy from last season. Yes, ginger-phile, RHM has a page about Wendy (the real one and the burger-pixie from the commericals). What costume will Erin wear this Halloween?